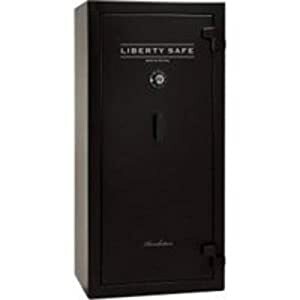 #1.1 7 Best Liberty Gun Safes on the Market! #1.2 Why Choose Liberty for Your Next Gun Safe? Gun safe is an absolute necessity if you have firearms. You need to ensure that your guns do not fall into the wrong hands, and this is best accomplished through use of a dependable and secure safe. Because of the importance of this product, you want a company that manufactures gun safes that you can depend upon. This is where Liberty has become one of the leaders in providing quality safes that people can depend upon. They not only make outstanding safes that are built with materials that you can depend upon to keep your valuables secure, but make products that are head and shoulders above most of the competition. 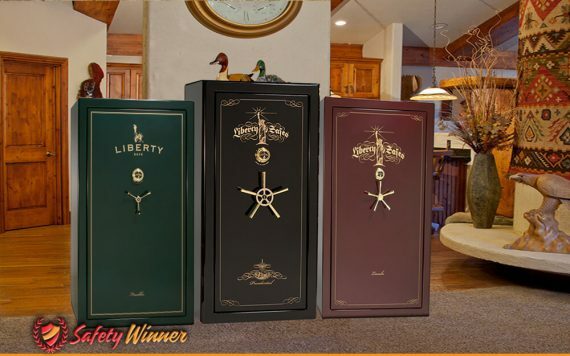 7 Best Liberty Gun Safes on the Market! Liberty provides a great array of safes that could be the perfect option for you, but not everyone fits your specific needs. Here are seven options you may want to consider that may work for what you need. Provides a great deal of protection against unauthorized access. The size of this safe is going to be intimidating to any thief. Plenty of storage space and can hold up to 48 firearms. The very best doesn’t come cheap, and this is an expensive option. Not really much negative to say about this safe. This is not only one of the best Liberty safes that is made, but is one of the very best safes you are going to find! It starts with the fact that this safe is able to hold up to 48 guns, as it comes with a lot of room inside, thanks to measurements of 60.5” x 25” x 42 inches. That’s a lot of storage space. Even with 48 weapons being stored inside the safe, you still have room in the upper shelving area to store such items as magazines, night vision goggles, and ammunition. However, if you have a lot less weapons, the safe comes with adjustable shelving to allow you to customize the safe to fit your needs. The design of the safe is fantastic on the exterior as well. It uses a thick 11gauge steel frame that comes with a lifetime warranty. This safe is meant to be both pry and impact resistant. You also love that it comes with a fire protection of up to 60 minutes. The door is held in place by 12 bolts, with four on the top, bottom, and side of the door. This will absolutely ensure that someone is not going to pry open the store to gain access into your safe. You also like that the triple case is made of hardened steel plates which will protect the lock from a person attempting to drill through. The locking mechanism uses an electronic lock. You are able to customize the code to fit your needs, and takes a matter of just a few seconds to get the safe open. This minimizes the time you need to access your firearms in an emergency. Weighing in at 792 pounds, you can be sure that this is going to give you every bit of the protection you need. It is a stylish looking safe which comes with a lot of room that you can customize to fit your needs. Truly a choice you will love. Military style locking bars ensure burglars will not be able to pry this safe door open. Can hold up to 18 firearms. Comes with a 63,000 BTU fire rating. Locking mechanism is smooth and easy to use. Does not use modern technology to unlock the safe. After extended use the lock can start to cause trouble, maybe not even allowing you to open the safe. Must apply pressure to get the door to fully close to lock. Sometimes what you are looking for is simple protection of the things that matter to you most. You want to own a safe that you can feel confident is going to do the job, and this is one that you can have a great deal of confidence in. It starts with the protection that it provides against a person being able to pry toward drill their way into the safe. The safe uses a set of military style locking bars, making it virtually impossible for a person to pull the door off of the safe and less the doors already open. In addition, the lock is specially protected to ensure that a person is not able to drill into the lock. Fantastic in the design to give you confidence no one is breaking into your safe. You also get up to 30 minutes of fire protection. The safe promises a 63,000 BTU fire rating, giving you one of the highest marks available. Because of its dual layer construction, it is able to resist the heat of a fire to the point of giving you plenty of time to allow emergency professionals to quench the flames. You should be able to hold up to 18 firearms in the safe. Its dimensions are 22” x 29” x 60”, giving you plenty of space to be able to store a large assortment of weapons, or you can customize it using the shelving that is provided. This allows you to make the safe so that it accommodates your needs. The safe uses a standardized combination lock, but it is one you can have a great deal of confidence in. It is easy for you to program, and takes but a few seconds to have your safe unlocked in an emergency. Designed to give you the optimal amount of protection from those attempting to break into your safe. Provides fireproof protection for up to 30 minutes. Fantastic interior that is padded to protect your valuables. Can hold up to 24 firearms. Does not take advantage of modern technology. May not be able to put 24 firearms in here. Depends upon the type and size you are using. This safe offers you the opportunity to be able to store up to 24 guns comfortably. 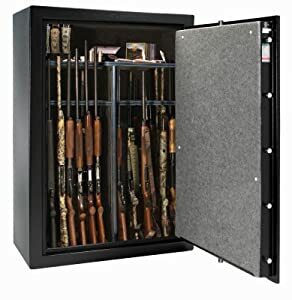 A gun rack is included inside the safe, which is built in a special way to afford you the opportunity to take advantage of all the space available inside the safe. There is a non-adjustable shelf in the top of the safe where you are able to store binoculars, ammunition, magazines, or other items. Plus, you can add additional shelves inside the safe to give yourself a greater amount of organization. The inside provides 13.8 ft.³ of space and the dimensions are 60 inches tall by 29 inches wide by 22 inches deep. That’s a significant amount of space for you to be able to store a large number of weapons. Plus, the interior is completely upholstered, protecting your weapons and other accessories you place inside the safe. While there is a lot of space for you to be excited about, it is the protection that the safe offers that you are truly going to love. It begins with a 1 inch composite fire door that is able to open 180°. This gives you complete access to the safe by ensuring that the door is not a hindrance to you. You will absolutely love how well designed this safe has been created. It comes with a heat activated door seal, and the door gussets are specifically designed to be anti-pry. The exterior is made of a 14gauge steel, and comes in a triple case hardened steel plate. No doubt that this safe is going to provide you with the optimal protection against those who would attempt to break into your safe. Plus, you get the added security of it providing fireproof protection for up to 30 minutes. It 63,000 BTU rating is something that you can depend upon should an emergency like a fire occur. Why Choose Liberty for Your Next Gun Safe? For those who are looking for a safe where they can depend upon the quality, there is nothing like something made in the USA. You can be sure that this is an outstanding quality safe. Liberty safes are made to be fire resistant. Not only do they provide you with a great level of quality, but protect your firearms and valuables should a fire occur in your home or office. This is a company that builds dependable products, and they stand behind their work. This can be seen in the fact that most of their safes come with lifetime warranties, letting you know that they expect their products to last the length of your lifetime. These safes are built with an incredible durability to them, and they use quality gauge steel to ensure that the safes are resistant to unauthorized attacks. The design of doors, the protection of the framework, and the locking system gives you confidence that your valuables are safe. Most of the safes afford you the opportunity to organize the interior to fit your needs. This allows you to customize shelves, add gun racks, or different accessories to get the very most out of your safe.